The ToneLib is an application for Win and OSX which allows you to see, change and save all the settings in your Zoom pedal through your computer. Intuitive drag-and-drop interface will allow you to build your Effect Chain and design the sound you need in the easiest way. As soon as you’ve reached the sound to your liking, you can save it both on your personal Zoom device and your computer, or even share it with other. You can download it from the downloads section www.tonelib.net. The program is free. Enjoy. Any feedback would be greatly appreciated! Last edited by Tonelib on Sat May 12, 2018 8:42 am, edited 1 time in total. On behalf of the Zoom community, i'd like to extend a thankyou for this invaluable contribution ! WOW! Very great work @Tonelib. That sure is nice Tonelib, can't wait to use it on my MS60B. Question: Do you know if there are any plans to release an editor for the G3N I just purchased today? It would be great if they offered a G3n editor. In a ideal world, there'd be access to additional parameters that are not available because of the 1-page/4-knob limitation. But I won't hold my breath. A new major version of ToneLib has been released (Win/MacOS). 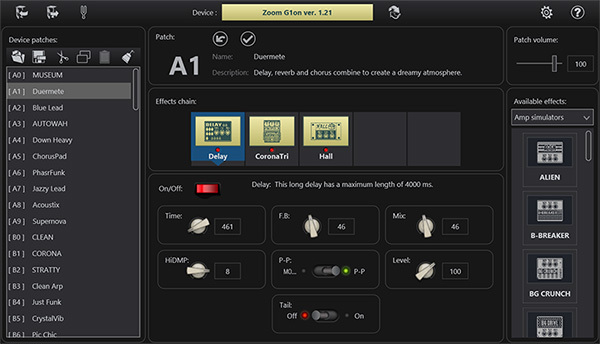 It is now support the Zoom G3n/G3Xn/G5n/B3n devices. Any feedback would be greatly appreciated! Cool, one suggestion i have. It'd be nice to see the version number of Tonelib itself added to the download page link, and/or file name. That way people could compare version numbers to a previously installed one and know a newer update version is available at the site. 1. editing, and quasi-realtime control of parameters via MIDI? 2. selecting presets more freely with on-screen palettes and MIDI? Sorry, I’m late to the party! This looks fantastic and a real asset for users of the MS stompbox series. I presume though, that this app will not work with the MS-100 BT; are there any plans for a similar app for use with this model? I agree it would have been great to have an editor for the MS-100BT. Since the MS-100BT is bluetooth only, they would have had to have built that kind of access into the firmware. If they did, they made no use of it in their stomp-share app. Now the pedal is discontinued so no new modules, no new firmware. - various bug-fixes and improvements.